Super easy to make and smells utterly delicious. Heat 2 tablespoons of the oil in a large, lidded flameproof casserole dish. Season the chicken thigh fillets and brown them in batches over a high heat, removing to a plate as they are done. Preheat the oven to 150°C, fan 130°C, gas 2. Add the remaining oil to the casserole and cook the onions and red and green peppers over a medium-high heat for about 8 minutes or until starting to colour at the edges. Add the garlic, cumin, smoked paprika, chipotle chilli paste and cocoa powder and cook, stirring, for 2 minutes to bring out the flavours. 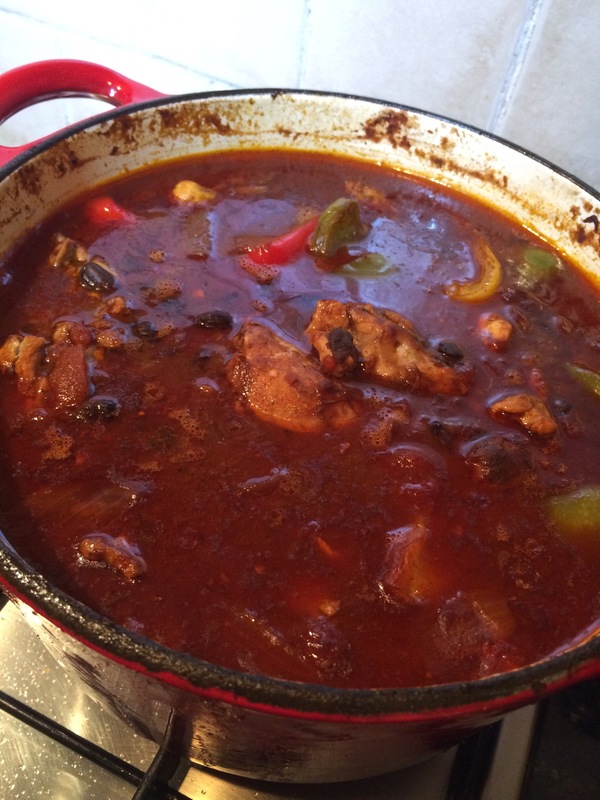 Return the browned chicken to the casserole and stir to coat in the spicy mixture. Add the tomatoes and the rinsed black beans, stock and some seasoning. Bring to a simmer, cover and transfer to the oven to cook for 45 minutes, until the chicken is beautifully tender.